Hey, it’s my birthday! (technically yesterday) Wee! My favorite thing to get on my birthday is new readers! Know anybody that likes jokes? Send them an email, post a link on Facebook, send a tweet, post a comic on reddit or tumblr or your favorite message board, print out a comic and hang it up at work! As long as you don’t break any laws or make anyone angry I’ll have an extra happy birthday! Thanks! I get this for real when I have too much salt in a short period of time. Usually from peanuts. I have to force myself to drink lots of water to prevent it. 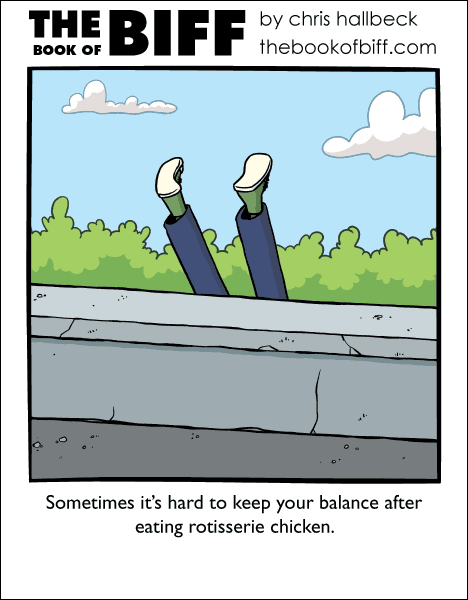 I think it’s because a rotisserie would be spinning, and that makes you dizzy? Happy Birthday, and I actually have an idea of whom to recommend this comic to, come to think of it. Happy Birthday Chris. Have been reading your comics for quite some time now and am still amazed how you manage to update three of them every day. Quite some discipline you have there. I’ve been using biff for teaching English by the way. It’s a nice way to have beginners try and understand just a single sentence. The extra bonus is the reward of getting the point of the comic and finding it funny. The best is that the archive is so long that we can keep going for hours on several sessions. So, Kudos to your stamina and discipline and a very happy birthday! Wow that is really cool! And thanks! Happy Birthday, Chris, and many many more! How about an old reader that hasn’t come by once in a while? I’m still reading and still enjoying, Chris, I just have much less to say. Happy belated Birthday!